Cave will bring the wizardy sidescrolling carnage of Deathsmiles to PC next spring. This is the second Cave shooter to arrive on Steam after Mushihimesama. In this one you play as one of five wizards/witches. Each character has a familiar—dragon, owl, bat, flower nymph—who can return fire on your behalf as you face down the infinite armies of hell to save the world of Gilverado. Expects lots of fairytale iconography, bosses that barely fit on the screen and waves that can strike from the right and left side of the screen. It looks neat, though it's not one of our most anticipated Cave games. 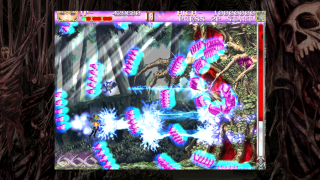 Deathsmiles was ported the Xbox 360 in 2009, so perhaps it's a quicker job than earlier vertical shmups like Dodonpachi. As with Mushihimesama, the PC version is handled by Degica. Keep an eye on the official site for more, and enjoy this picture of Giant Cow Mary.